At least 22 transgender people have been killed in the United States since the beginning of 2018 — 82 percent of them were women of color; 64 percent were under the age of 35; 55 percent lived in the South. We say "at least" because the stories detailed in this report very likely undercount the number of transgender people who were killed in the United States this year. 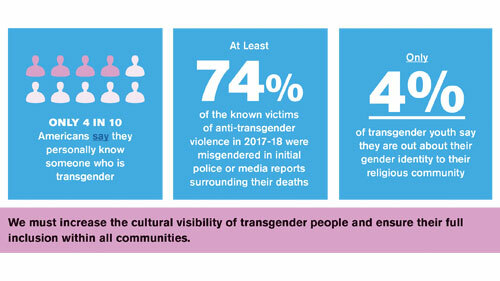 Although advocates, bloggers and media groups have elevated this crisis in the past several years, data collection is often incomplete or unreliable when it comes to violent and fatal crimes against transgender people. Some victims' deaths may go unreported, while others may not be identified as transgender in the media, often because authorities, journalists and/or family members refuse to acknowledge their gender identity. In life, each of the individuals memorialized in this report went to extraordinary lengths to live authentically as who they were. In death, we must honor their truth with bravery and action. Download A National Epidemic: Fatal Anti-Transgender Violence in America in 2018 or flip through the digital version below.